Choosing a single ice maker can be challenging when you have so many options to choose from. That’s why we have compiled a list of the best countertop ice makers. So you can have a look at the top options and choose the one which suits you best. There are plenty of ice makers out there, but only a few of them are quick and quiet at making ice. Which one should you choose? Let’s figure it out! Choosing an ice maker is a personal decision and everyone has their own situation. This makes it impossible to recommend a specific ice machine for everyone. There are numerous factors to be considered before purchasing an ice maker. Those factors are storage capacity, output, noise, style, design, and budget. That’s why it is not going to be an easy decision. 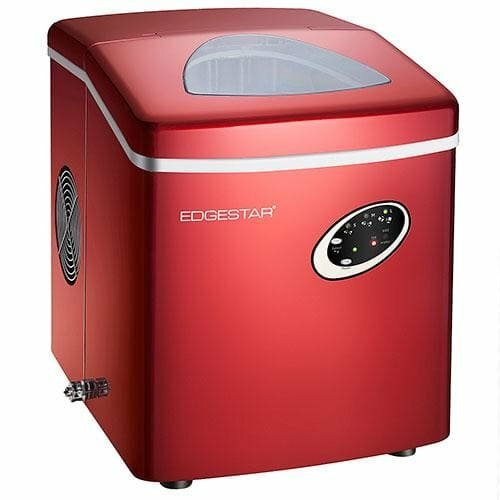 Our list takes a look at the best countertop ice makers available, and this list will help you to choose the ice machine which suits you the most. A note of caution. Most ice machines do not have refrigerated ice storage bins. This means the ice melts and gets continually topped off while the ice maker is running. Below is the table which shows the best countertop ice makers. Without wasting any further time, let’s jump on to our best countertop counter ice maker list. Our first ice maker in this series comes from hOmeLabs. It is one of the better reviewed ice machines on the market and is a best seller. Let’s find out why. The machine makes up to 26 lbs of ice in 24 hours, and produces icecubes in under 12 minutes. The bin storage on this unit 1.5 lbs. The normal operation of this machine is considered well below average in noise and it automatically shuts off when full. This model is designed with a removeable basket, is easy to drain, and comes with an ice scoop. The only downside in this ice machine is that it is only offered in silver. Overall, the hOmeLabs is my all time favorite and best countertop ice maker on the market for 2018. The build quality is great, performance is top shelf, and the design looks nice. 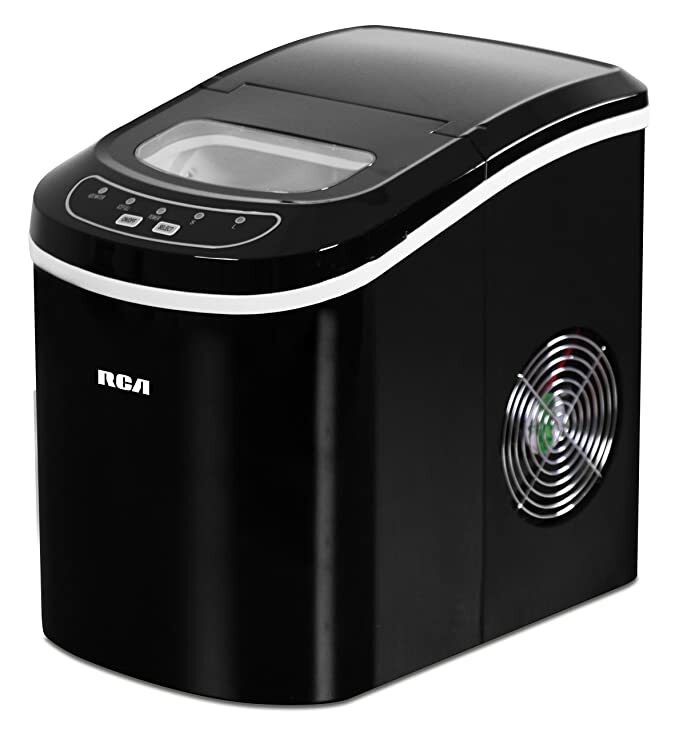 The next ice maker on the list comes from RCA. It is a reliable little work-horse that has some really nice attributes. It also comes in black, silver, white, and red. This machine requires very little maintenance. All you need to do is fill up the reservoir with water, push a couple buttons and voila! Ice is made! Noise performance on this ice maker gets top marks. The reliability and ease of maintenance have made this a popular countertop ice maker on Amazon. It is perfect for a basement bar or man cave. The only downside to this machine for this unit is some reviewers have mentioned fan guard noise developing over time. A screw or two may need to be periodically snugged down. If you like the black and don’t have super large parties, this is an excellent choice. Here is the stainless steel option in the list. 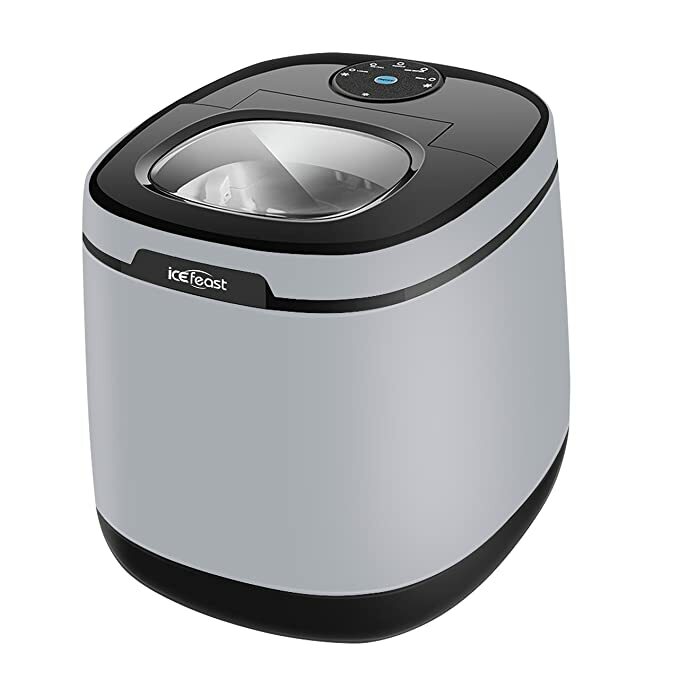 The Igloo Ice Maker is one of the most easy, convenient, and inexpensive to install of all the machines. Easy to move around your counter top or bring it to the pool, on your boat or anywhere else that you want to have ice right at your fingertips. Portable Stainless Steel Ice Maker Over-sized Ice bucket holds 2.2 lbs of ice Choice of 3 Ice Cube Sizes (small, medium and large) Enjoy a batch of ice in as little as 6 minutes Produces 26 lbs of ice per day. The negatives to this units is that it can be a little noisy. Overall, the Igloo is a decent choice for anyone looking for the stainless steel look, or needs to buy an ice machine with more capacity. They also offer a 48 lb capacity unit. The Icefeast is the most expensive unit on the list, but it also produces the most ice. It’s also my personal favorite in regards to design appeal. This ice maker produces twice as much ice in a day as the others, and it will throw out 56 lbs in 24 hours. It looks damn nice doing it if you enjoy the sleek look. Ice storage capacity on the Icefeast is not that great, but it makes ice faster than the rest. 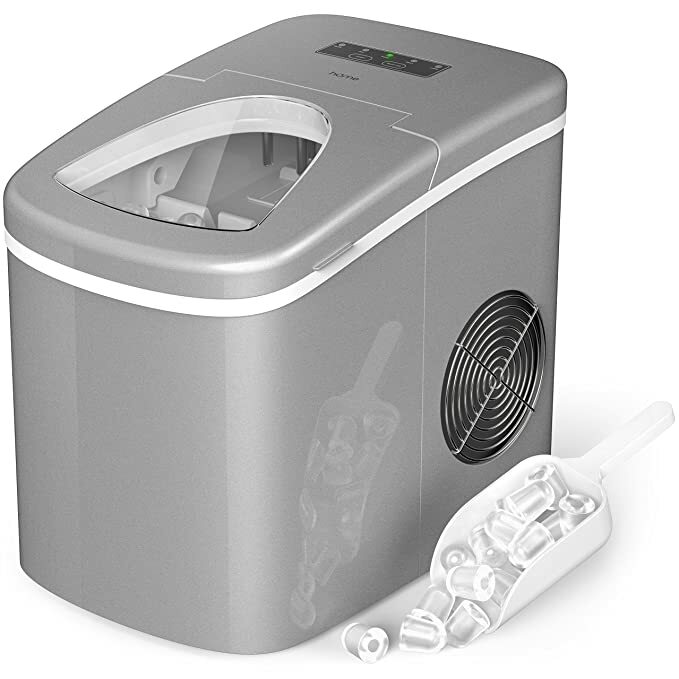 This is the best option for anyone needing a lot of ice that still needs a portable unit. This unit really doesn’t have a downside other than price. It does cost more but makes double the ice, so it is a good choice for anyone needing the extra capacity. Wrapping up, this countertop ice maker will be a great purchase for anyone wanting a modern clean look. This machine is controlled by micro-computer, automatically reminding for water shortage, Automatic stand-by when Ice-Full state. Auto shut-off and stand-by mode, self cleaning feature. 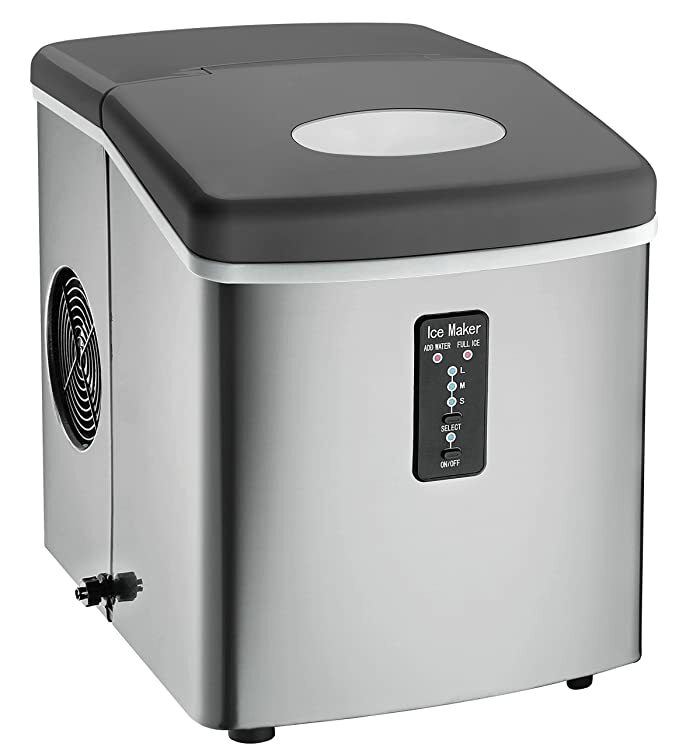 Not only is this icemaker portable thus allowing you to use it in any place that you wish but it also produces quantities of ice of up to 27lbs per day. Built with adjustable levelling legs, this ice maker can fit perfectly in any space and it has a storage capacity of up to 25lbs. It has a drainage facility and comes in the colour black which blends in very well with many types of decor. Amazingly, it takes an average of only six minutes to prepare the ice so you can imagine just how much ice one can produce within an hour. The temperature required for ice making varies from forty five degrees to about one hundred and ten degrees and the ice produced is free from impurities such as rust and does not emit foul smells. The only downside in this ice machine is that it beeps a bit when the water is low or the ice is full. Another appealing factor about this icemaker is its industrial look and LCD screen. The MRP Ice Maker is operated through the use of computerized controls, making it easy to control the ice maker on a timer. 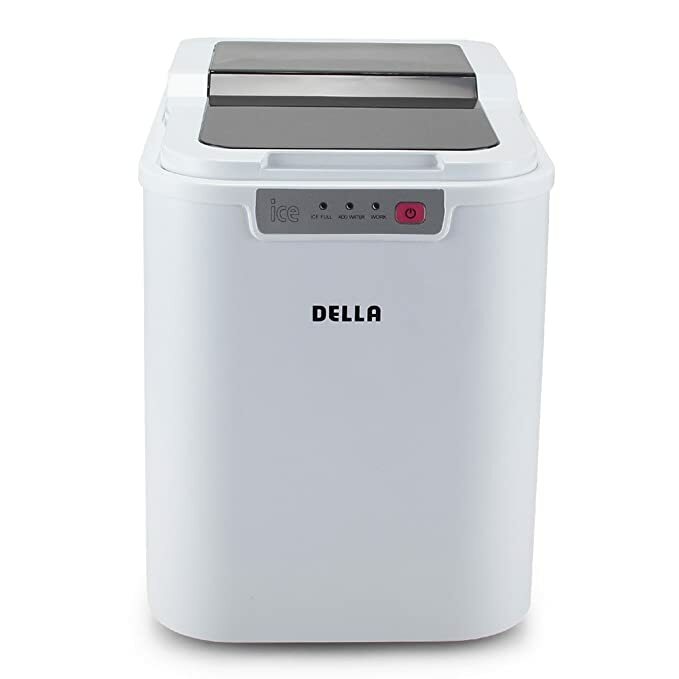 When you want a simple yet stylish ice maker, Della may be the best choice for you. There are 4 verions of this unit available and they all look sharp. It’s perfect for small kitchens, dorms, RVs, and anywhere you want to entertain. Just plug in unit, add water and enjoy a batch of ice in as little as 6 minutes. The only downside in this ice machine is that it has fewer features than many of the other options. Perfect for your RV, boat, or small kitchen, this ice maker is compact, bars, restaurants, portable and works anywhere there is an outlet available. This model fits in effortlessly with your room’s existing decor. You’ll never have to guess when the ice container is full as a state-of-the-art alarm system will let you know. Compact and portable, you can place this ice maker practically anywhere. It also comes with a storage bin that can hold up to 2.5lbs of ice and produces 28lbs per day. It has an automatic shut-off function which protects against overfilling of the ice maker. That way, the user can go about other activities without worrying that the ice maker can malfunction due to overfilling. The only downside in this ice machine is that it is slower to make that first batch of ice. What should you Consider when you’re Choosing an Ice Maker? Having an ice maker is a great thing and it allows you to plan for parties and cool your drinks during those hot summer days. With the reviews above, you should now have a rough idea of which ice maker is best for you. However, if you have no knowledge of ice makers all the above might still feel a bit alien. So to help you pick the best ice maker for the right job, we have listed a few things below that you should consider before your purchase. There are many varieties of ice cubes that can be made using ice makers and they all serve different purposes. Examples include cubes, half cubes, nuggets, flakes, gourmet, pearls, and octagons. Flake ice is mainly used in the display of produce and seafood as it allows you to showcase the food in a healthy cool environment. Cubed ice and nugget ice are mainly used in beverages to keep the drinks cold. Depending on the type of ice you wish to make, the machine chosen will vary. Various machines produce differing amounts of ice. If one wants a lot of ice, it is a good idea to go for a machine that can produce huge amounts of ice without malfunctioning. Machines with high capacity can produce as much as twenty-three kilos of ice a day while working at their optimum and are preferred for commercial uses and social gatherings. They also cost more as compared to smaller machines with less ice producing capacity. However, if one requires a machine to produce much less ice, it is more viable to get a machine with less capacity. Not only will one save on buying costs but one will also save on operation costs and will use less space. Are You Concerned About Looks? If you are in the market for an ice maker that can match the decor of your space, it is possible to find an ice maker that satisfies that need. 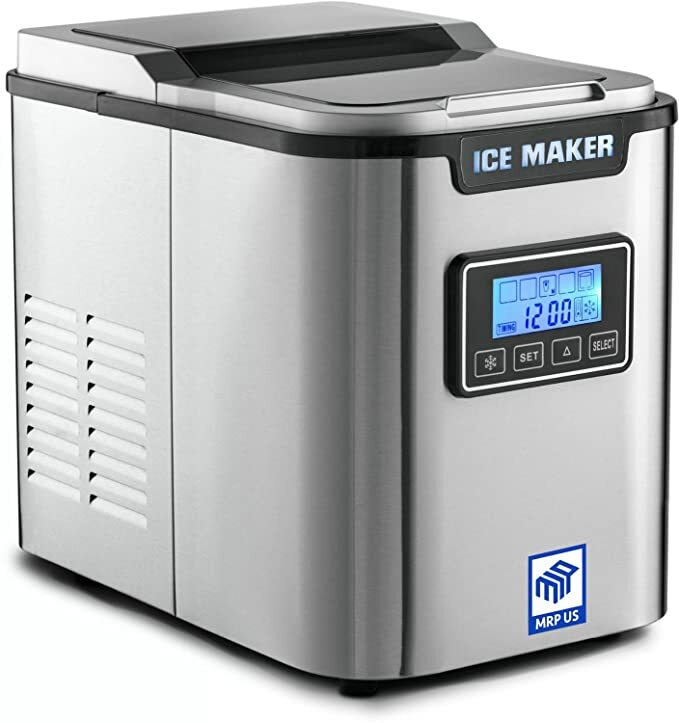 Most ice makers are available in the colors white, black and stainless steel. There are more colors available for one looking for a specific color which can be found by browsing through the available machines and finding one with a color that works for you. The finishes of ice makers also vary such that one can choose amongst various designs. For domestic use, one can opt to go for a more stylish look whereas, for commercial uses, aesthetics will probably not matter as much. Whichever choice the user makes, one can be assured of finding a machine that will serve as desired. The affordability of ice makers varies depending on their capacity as well as their portability. However, the range in prices is not that big and reviews have shown that most cheap ice makers end up being expensive in the long run. This is because they are more likely to need repairs within short time periods and as such, the user will end up spending a lot more than was intended. More affordable machines within reasonable budgets are likely to serve one for longer and do away with the constant need for replacement of worn out parts. However, this also depends on how often you will use the ice maker. In an instance where the ice maker is only used during special occasions, it is more viable to get the cheaper options available. Where the ice maker will often be in operation, going for a more expensive and more durable machine is the wise option. The cost will also be influenced by the efficiency of the machine as well as its ease of use. The cost will vary depending on one’s needs and preferences. Where Will the Ice Maker be placed? Ice makers can be installed in different ways depending on their design: freestanding, built-in or recessed. The choice of an icemaker will depend on how much space is available for it to be placed in. For icemakers with adjustable leveling legs, they can be placed in any space as they can extend upward, thereby creating space underneath for other items. It is also important for some icemakers to be given space to them to reduce friction and give enough room for ventilation to prevent overheating which can damage the machine. If one wishes to place an ice maker outside, it is important to get one that cannot be affected by adverse weather. A good buy for outside use would be a machine that has been constructed with stainless steel as it cannot be damaged by water or other environmental factors. Ice makers consume different amounts of energy and the energy used in the production of ice relates to the running costs of the machine. The higher the amount of energy used, the less efficient a machine is and therefore the more money used in operation and maintenance of the machine. For domestic use, opt for a machine with reasonable energy consumption. Once you have decided on the best ice maker for your needs, it is important that you learn how to clean it properly and maintain it. If you aren’t maintaining your ice making machine properly it can become faulty and this cost you quite a lot of money especially if you do not know how to repair the maker yourself. Not only can you incur additional costs due to lack of maintenance, but parts of the machine that come into contact with water are likely to form slime or scale which could get into the ice and cause adverse health effects to anyone who consumes the ice. In order to prevent this, an ice machine must be cleaned and sanitized every six months. In a case where one notices that the machine requires being cleaned more often than the six month period, the water quality should be tested as it may be the causative factor. There are times when one may experience trouble when operating an ice maker. Some of these issues include lack of release of ice or slow harvesting of ice by the machine, lack of the machine cycling to harvest mode, low production of ice and production of ice that is either not clear or the cubes have not formed completely. Such problems point to a malfunction in the machine and should be dealt with immediately they are noticed as failure to this can lead to major problems that could cost you more money. Proper maintenance of the machine through regular check-ups is one of the ways to avoid such issues as well as avoidance of overworking machines beyond their expected capacity. When one pushes the button and waits for an ice maker to pop out the ice, not much thought goes into the intricate process involved in the production of ice. Ice making is not as simple a process as it looks. All ice makers work in the same way by making use of four key components: the condenser, the evaporator, the throttle valve and the compressor. The compressor works by compressing low-pressure refrigerant vapor to high-pressure refrigerant vapor. The high-pressure refrigerant vapor is then passed on to the condenser where the vapor is condensed into a high-pressure liquid. This liquid is then drained to the throttle valve where it is turned into a low-pressure liquid. The liquid is then taken to an evaporator where a heat exchange is done, thereby creating ice. That makes up one refrigeration cycle which will be repeated depending on the quantity of ice required. Would you believe it if someone told you that taking cold drinks is actually beneficial to your health? Chances are that you would probably not. But here is the thing. Drinking cold drinks has been linked to having positive effects on our health. One such benefit is the fact that cold drinks burn calories. People have searched for all manners they could use to cut a few lbs. How about gulping down an icy drink and let your body do the work for you? Cold drinks are like cold showers. Cold temperatures increase our metabolism by up to 50%, enabling our body to burn calories. There are studies that show that cold drinks stimulate the enjoyment part of our brain, making us happy in the process. So, the next time that you are feeling low, take a cold drink and let your worries slip away. Having considered these benefits, getting an ice machine seems like a swell idea. However, cold drinks should not be taken in the cold weather unless you are open to the idea of developing a cold. Here is taking cold drinks for better health. When we are looking for an ice maker, there are very many factors that we consider before settling on the one that fits our needs best. Things such as price, durability, and ease of use play a vital role in the determination of what machine we take home with us. Ice makers help us in our day to day activities, whether at home or our workplaces and as such, their efficiency is highly relied upon. The machines outlined above are some of the best that the market has to offer. Not only do they come in sleek durable makes but they also produce huge quantities of ice. Their ease of use and dependability makes it easy even for the inexperienced to operate the machines at ease. If you are looking for an affordable ice maker that will still be in operation for the years to come given the right care and maintenance, these machines will suit you perfectly. And they are not heavy on the pocket either which makes them ideal. Please let us know which unit you decide to go with in the comments. Also, feel free to come back later and let us know how your model is treating you.